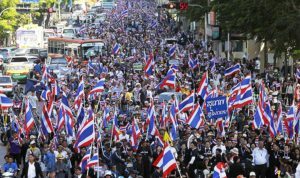 WASHINGTON — Thailand is suffering internal political turmoil as protesters have flooded the streets of the capital city of Bangkok, upset with the current political status quo. Reuters reported that the main opposition party, the Democrat Party, has not been able to agree on whether they should run in an early election or back the street protesters. They reappointed a former Thailand premier Abhisit Vejjajiva to head their party leadership, but are conflicted. The protesters are backed by the Thai elite and middle class and want immediate political reforms. Current Prime Minister Yingluck Shinawatra called for an early election to dissipate the street protests, with no luck so far. Also, protesters want to end the influence of exiled and former Thai leader Thaksin Shinawatra, who is Yingluck’s brother and supposedly runs the country. Suthep Thaugsuban is leading the street protests and worked as Abhisit’s deputy prime minister up until 2011. The quick elections will take place on February 2, 2014, but whose registration period ends December 27th of this year. That leaves the opposition party has little time to decide what it will do.